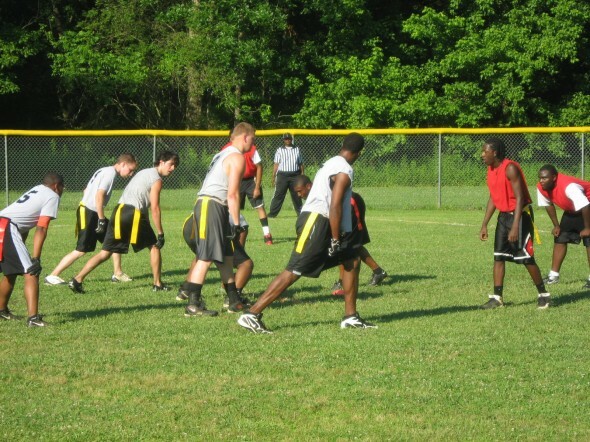 The Acworth Parks and Recreation Department has the most premiere adult flag football league around. Records, statistics, player(s) of the week, write-ups and box scores are posted online after each game, and the AAFFL Cotton Bowl will end postseason play. Game play is 7 on 7 and teams may have a roster of up to 17 players. All games are played at the football fields at the Acworth Sports Complex with no cost to spectators. Both men and women are welcome. Register your team now and start building your team dynasty. If you do not have a team, come out and participate in their Free Agent Sign-Up Day on Monday, February 25, 2019 at 6:30pm located at the Acworth Sports Complex – football fields. Registration opened on November 5, 2018 for City of Acworth residents and November 12, 2018 for non-residents. The cost is $600 per team and $55 for each free agent. Space is limited so register today at www.acworthparksandrecreation.org.